SEVEN leaders of National Sports Associations (NSAs) have expressed its support for the candidacy of boxing chief Ricky Vargas for president of the Philippine Olympic Committee (POC). 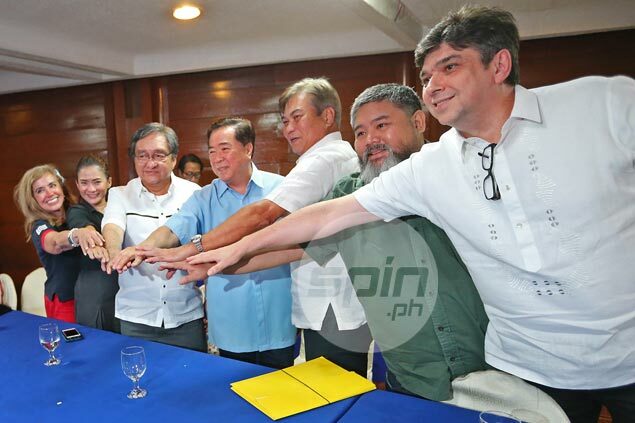 The seven NSA leaders came out in the open and expressed support for a Vargas presidency on Thursday, saying it's about time a change in the POC leadership be made after 13 years under Jose 'Peping' Cojuangco. The group headed by Association of Boxing Alliances of the Philippines (ABAP) secretary-general Ed Picson, said it already has gathered the support of 27 NSAs which will vote for Vargas should he be allowed to run in Friday's election. A total of 43 NSAs are eligible to vote in the POC poll. Picson though, would rather not divulge the names of the NSA leaders as the camp of Cojuangco might be able to persuade them to change their votes heading to the poll at the Wack Wack Golf and Country Club. Karen Caballero, president of the sepak takraw association, said she has at her disposal the 27 names of those supporting Vargas. "We will not name names because we're protecting their privacies," said former Congressman Monico Puentevella, the recognized chief of weightlifting in the country. "Maaaring may madagdag pa or maybe ito na 'yun," said Picson, who, was also joined by football's Nonong Araneta, Robert Bachmann of squash, Cynthia Carrion of gymnastics, and Richard Fernandez of shooting. Now that they have the numbers, question is will Vargas be allowed to run? The POC election committee headed by former International Olympic Committee (IOC) representative Frank Elizalde now holds the key in scrutinizing whether all candidates seeking the post of president and chairman, respectively, are all eligible to run, including Vargas. Cojuangco and Vargas submitted their respective applications at the POC office on Wednesday, the same with cycling head and Vargas ally Rep. Bambol Tolentino and Ting of Ledesma of table tennis, who will be contesting the chairmanship. An election committee, also headed by Elizalde, declared both Vargas and Tolentino ineligible to run during the 2016 poll for failing to actively attend the POC general assembly. The seven NSA leaders however, vowed not to allow that to happen again, insisting it’s the general assembly that should decide who are eligible to run or not. “It’s the general assembly and not the executive board that should define what is an active member, not the Comelec, which they might insist (on Friday).” said Puentevella, whose claim to represent the Samahan ng Weightlifter ng Pilipinas in the polls is being questioned by the Cojuangco camp despite being recognized by the international federation as the president of the country’s weightlifting body.